« Why Value Creation is more Important than Value Extraction? Building Silos or Breaking Silos? Internal Customers is a Flawed Concept! I spent many years of consulting on internal Customers. I helped companies look at internal Customers, and how they could get value from the other departments of the company. And keeping internal Customers happy. Companies would throw SLA’s at me (Service Level Agreements) so that performance of departments and expectations of internal Customers were met. But my work with external Customers showed that one very important reason for Customers to be unhappy was the various silos that are built in companies, and how departments are insulated from each other. Silos are promoted by the concept of internal customers. Departments tend to be independent of each other. This leads to a lack of internal cooperation. Even worse, everyone thinks the customer is taken care of because there is a customer department and they all wash their hands off the customer and think they have no customer role. 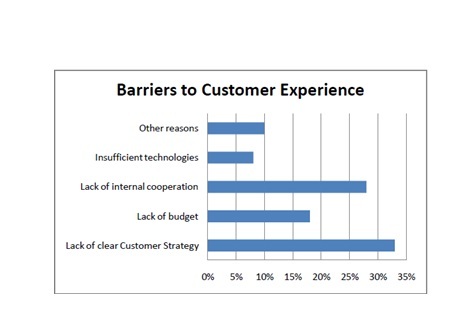 The results of a survey with 400 CEO’s shows that the two major reasons for failure to provide good Customer Experience are (1) Lack of a clear Customer Strategy, and (2) Lack of Internal Cooperation. Thus if you want to give your Customer a good experience abandon the concept of internal Customers. Build internal teamwork and cooperation. We work with various departments in defining their Customer roles. We ask why departments such as HRD and IT are considered staff functions. The reason is they do not add value. They are really extractors of value not creators of value. When have you heard an HRD CXO ask: What value have I added to the employee? When did he ask whether the employee feels valued? Is it the HRD CXO’s job or is it the department manager’s job? Or is it everyone’s or no one’s job? And we break silos by building a Customer strategy with tasks and leadership from various departments. We build the Customer’s Bill of Rights, backed by a Circle of Promises from various department so that the Customer realises his rights are being honoured by the company. This is the first step to creating Firms of Endearment, where all stakeholders feel endeared and the profitability increases. Break silos soonest! Forget the concept of Internal Customers. Customer Value Foundation (CVF) helps companies to Create Value and profit by Creating Value for the customers, employee and for each person working with the companies.Total Customer Value Management (TCVM) transforms the entire company to focus on Creating Value for the customer by aligning each person’s role in Creating Customer Value and getting shareholder wealth and Value. This entry was posted on May 24, 2013 at 8:06 am and is filed under Business & Management. You can subscribe via RSS 2.0 feed to this post's comments. You can comment below, or link to this permanent URL from your own site. I agree Gautam, most customer transactions run across company departments (silos) and can therefore run into difficulty in those gaps between departmental responsibilities. Wise companies make certain that employees understand that everyone is in customer service (responsible for the customer’s experience within their area of expertise) and everyone should have at least a basic knowledge of the entire transactional process. I think you make a very good point here. From a customer’s perspective, you only see your supplier as a company and you have the expectation that you get seamless service, no matter who is involved in the background. By the way: isn’t this the same attitude we have towards our suppliers, no matter if in private life of from a business perspective? Question is how to overcome the silos / internal barriers and help everybody in an organization to change to a customer centric attitude. As mentioned above, a customer strategy is an excellent approach in setting everybody’s focus in this direction. When implementing such a strategy, one of the important facettes is the setting of the right measurement system. Companies should define KPIs and incentives across the various silos / departments or at least define what everybody’s contribution to these KPIs should be. Dashboards on customer centric performance should be visible to everybody in the company. There is also a need for defining cross-departmental processes and assigning owners to these processes. The definition of the processes should always come from the customer view: how (over which channels) are we communicating with our customers and what outcome do they expect from us. The whole area of social collaboration tools offers a lot of new ways how communication with the customer and customer centric internal communication can be managed in a way that silos are vanishing and communication will be without borders. Great insight, too often the internal branches rely on the customer service team to support them and yet they think it is an easy job. I agree 100%, the service we provide externally cannot be as efficient and effective as it should unless there is true co-operation amongst the internal service providers. A company or organization develops products and services with a view for efficiency in production, cost effectiveness and customer usability. Silos were created to protect people and create the illusion of subject matter experts. Sure you need staff that have the expertise; however, if they do not participate in the service culture then their outputs may not meet customer’s needs. Too often I have experienced the SME’s lack of customer consideration, yet without them where would we be? Today, there are so many opportunities to listen to our customers and take their feedback on board to improve service that can also result in efficiency gains and improvements for any organization. You’re spot on. To become the kind of customer-centric company that moves past business silos to truly prioritize the customer, you need to implement culture changes within your organization. Technology, like customer communities that bring multiple departments to one place to listen and respond to the customer, can help. So can having leaders who prioritize this, and vocalize that loudly and often. Generally, you need both to be truly effective. Thanks for sparking the conversation!